“Big data” involves using very large sets of information/data and looking for patterns in the data. Insurance policies are re-written as risks are better understood. Bank fraud is more easily detectable. Most likely customers are better targeted, and cyber security is strengthened. Access to large pools of data and the computing power to analyze that data in real time is made possible by inexpensive data storage and faster computing power. And these costs are moving lower. At the moment, big data may be interesting but not relevant to many if not most businesses. Over time, what we call Big Data will fundamentally change many businesses and professions. As one example, think of the concept of an “expert.” The expert is someone who has special training and, based on that training and experience, understands how to solve problems in a narrow, specialized field. A medical doctor is an example. Years of training are required before a doctor can begin meeting patients, diagnosing their illness and prescribing treatment. Most payments for medical treatment in the US come from public or private insurance. Each of these claims must be approved by the insurer as covered by the insurance and appropriate for the symptoms of the patient. The doctor is prescribing the treatment, but the treatment must be approved by an administrator who is deciding whether the doctor’s diagnosis was correct. The insurance administrator is not a specialized MD but is matching the doctor’s treatment recommendation against a database of “approved treatments” for those symptoms. Expert systems and big data are different but will move closer over time. When we think of the “family doctor,” a personal relationship is part of our expectation. A visit to a doctor today is less a personal relationship and more a quick connection with the medical data gatherers and a brief meeting with “the doctor” while she is entering our data in the system. 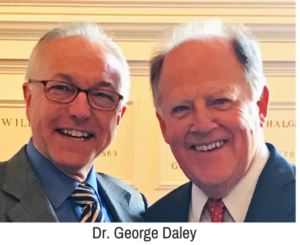 Dr. George Daley, dean of the Harvard Medical School, spoke recently on the challenges big data and IT present to the medical profession. Dr. Daley believes the role of the specialist will become less important as deep expertise resides more in smart systems based on big data. Medical schools training the wide range of medical specialties must be thinking now about the role of these specialties in the world of big data and smart systems. At a broader level medical schools and the medical profession as a whole, must reconsider the role of medicine in enhancing the quality of human life. Dr. Daley is asking what role doctors will play as the intermediary between the patient and the healthcare system. Are MDs independent specialized professionals? Or are they data gatherers, advocates for patients, or consultants to the patient? Big data and smart systems will drive similar changes in many businesses. Each leader must decide whether these changes are a threat or an opportunity to gain competitive advantage by better solving your customer’s problems.